I jammed my thumb in a drawer, and a bruise developed under the nail, starting at the cuticle. After three weeks it’s still deep purple. Is it normal for it to take this long to heal? That depends on you, your history of bruising and whether you have other signs that could point to a problem. Whether you closed a drawer on your thumb or knocked your knee into a table leg, a bruise is a sign that small blood vessels under the skin have broken and leaked blood. About half of all people are considered “easy bruisers.” Bruises show up at the slightest bump or even when you can’t remember injuring yourself. Conditions that can make you an easy bruiser include taking medications such as blood thinners, aspirin and ibuprofen…being deficient in certain vitamins, such as vitamin C or vitamin K…taking supplements, including fish oil, gingko biloba…spending a lot of time in the sun…and even consuming large amounts of garlic or alcohol. Different people have different healing times when it comes to bruises. Some people’s bruises disappear within two or three weeks, while others’ linger longer. Age can be a factor. Bruises tend to last longer for people older than 65 because of changes in the skin. Tip: As with swelling, you can speed the healing of a bruise by elevating the area above the heart, icing it for about 15 minutes every hour for the first 24 hours, and resting the injured area. It might take longer for a bruise under a nail to heal and may have to do with growth with the nail. 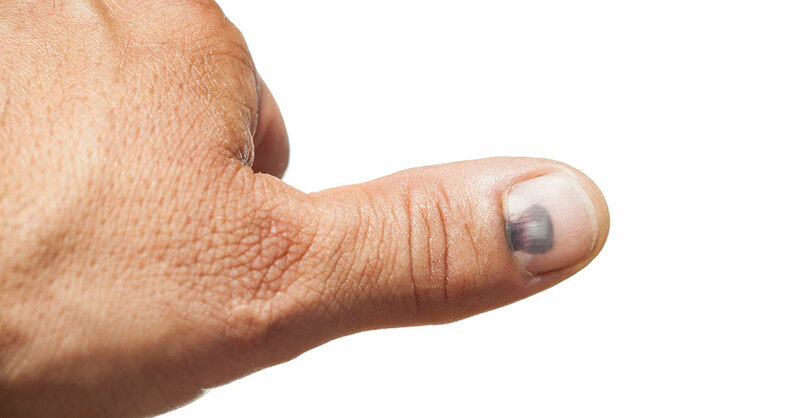 Most likely your current bruise isn’t something to worry about, especially if it’s moving up the nail, albeit slowly, as the nail grows out. Still, there are certain signs that any bruise, regardless of location, warrants a trip to the doctor. You have swelling and pain. If you had an injury and there’s swelling and pain at the bruise site, you could have a sprain or a fracture that needs evaluation and treatment. You have other signs of a bleeding disorder. You’ll experience more bruising and other types of bleeding if you have a disorder that impacts your blood’s ability to clot. Besides easy bruising, other signs to look for including having frequent nosebleeds, bleeding excessively after getting a cut or having dental work done, having heavy menstrual periods or bleeding at unusual spots, such as around your joints. You have symptoms of anemia. Anemia, a problem with red blood cells, deprives the body of oxygen. If you may have abnormal bleeding and bruising, you may have anemia. Other symptoms of anemia include shortness of breath, dizziness, a faster heartbeat, cold hands and feet, weakness, chest pain, pale skin and headaches. You have a large bruise on your torso. Small bruises or bruises on your arms or legs don’t usually point to an underlying issue. A large bruise on your chest, back or stomach, especially if you haven’t fallen and don’t know what caused it, should be examined. This could be a sign of abnormalities in clotting due to low or abnormal platelets in your blood and or an inherited bleeding disorder. This should be evaluated by a physician since blood tests may explain the problem. There’s a sudden change in your bruising pattern. A good rule of thumb is to pay attention to what’s common for you. If you suddenly experience more bruising for no known reason, get checked out by your doctor.